There was a massive shock for residents of Parkinson Street in the Burnley Wood area of the town when one of the houses blew up. The couple who lived there were in bed as an explosion wrecked their house at 4 a.m. The couple, both in their 20s, heard a boom and felt the ceiling fall in before being thrown into the road. The lady of the house said: "I couldn't tell you how we got there, but my next thought was for the dogs." They were dog breeders and at the time there were 16 3-week old puppies in the house but, with the help of Burnley Dog Rescue's Barbara Goodwill, they were all rescued whilst residents had to be moved out of the area and were given shelter at Fir Grove Retirement Home in Todmorden Road. The couple were taken to Burnley General Hospital but not detained. However, that was only the start of their problems and the man of the house was then arrested and charged with theft of gas, causing criminal damage to a house and being reckless as to whether life would be endangered. Another Burnley man appeared in court after an incident in Superdrug in the town centre. Mr Smith had just been released from prison the day before and he was seen self harming by staff in the store. He was cutting his arms with razor blades. When approached he began throwing toiletries and was shouting and swearing at staff and customers. The customers were ushered out and the man, feeling cornered, threw a cash register through a window to escape. Police had been called and he was captured. In court he was found guilty of affray and causing £500 of damage. He was remanded in custody for social reports. Parents were put on alert when two children, who had been taken ill before Christmas, were admitted to hospital with meningitis. Doctors, with the help of schools staff, prepared warning leaflets for parents and, given the urgency, delivered them all by hand. Opening a store on a Sunday was against the law but that was exactly what some stores had done in the lead up to Christmas. The council, who appeared to be turning a blind eye, were accused by some residents of showing no consistency given how quick they were to prosecute those who didn't pay their poll tax. And, via a number of public letters, they were told in no uncertain terms that people didn't want Sunday shopping but that was not the information coming from some of the retailers. A spokesman for Leo's said:"Customers have voted with their feet as the supermarket has done very well," whilst the word from Sainsbury's was: "Sunday trade has been exceptionally good." Manager of Ratner's, Mr Arun Palmer, said: "We have opened on all four Sundays and have done well on every one of them, but we have no current plans to open again on a Sunday." Burnley supporters were applauded and thanked by Linda T White who was Brigade Secretary for the local St. John's Ambulance Brigade. Ahead of the Christmas rush, Burnley Football Club had given them permission to collect inside Turf Moor before a home game and the collection raised £942. Ms White said: "It was far, far more than anybody had dared hope. We were grateful when the club gave us permission to collect and stunned when we counted up afterwards. I'd like to send a really big thank you the club and to everybody who gave so generously." Former manager Frank Casper and the club's ex-Marketing Manager Joyce Pickles had gone into the leisure and sportswear business, setting up a company called Glory Years. Clarets' chairman Frank Teasdale told the club's AGM, held before the Doncaster Rovers game, that Burnley FC had no deals with the new company. Having reported a profit over the previous year it was very much a quiet AGM with Harry Brooks the only dissenting shareholder as he criticised what he considered a poor return on commercial activities. It was match day, and we were hoping to get that Boxing Day defeat out of the system. We did just that, and, although we only one by a one goal margin, it was a terrific performance by Burnley. For an hour and more we gave what was probably our best performance of the season and the old phrase 'We could have had ten' was never more apt. This was top against bottom and we simply ripped them apart and had an incredible nine shots on target during the first half and the lead should really have been much greater than 2-0 at the break. Steve Harper was out for Burnley and manager Jimmy Mullen gave new signing Adrian Randall his first start in what was the only change from the Rotherham defeat. We took the lead after six minutes, by which time we should have already been two up. 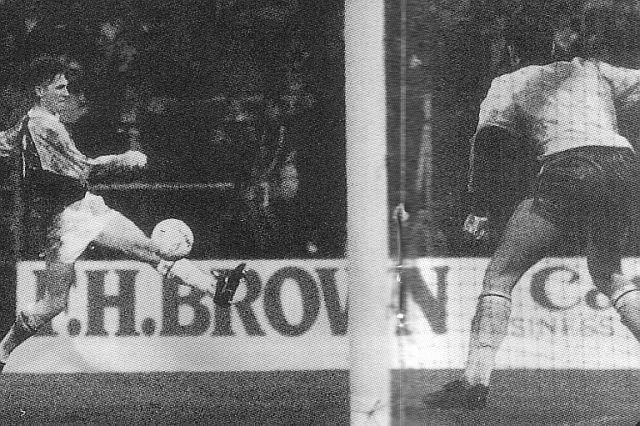 It all started when Joe Jakub headed clear a Doncaster corner. The ball found John Francis who played a quick ball out to release Roger Eli on the left. Eli went on a terrific run and then fed the ball in for Mike CONROY who took the ball round Doncaster goalkeeper Mark Samways and stroked the ball into the net. Midway through the half we doubled the advantage and again Jakub started things, this time hitting a ball upfield from defence. It was headed down by a defender but only as far as ELI who took the ball on before calmly lifting it over Samways. Nothing changed in the second half as Burnley continued to dominate and Doncaster must have wondered just how they got to the last quarter of an hour still only two goals behind. Then, incredibly, a 20-yard free kick was played to Kevin NOTEMAN who hit a shot through a gap in the defensive wall to reduced the arrears. It was ridiculous and this was a game we should have won by a bag full, but in the end had to settle for a 2-1 win despite dominating for almost the entire game. So that was six points from Doncaster, as well as an FA Cup and Autoglass Trophy win against them. What a pity we wouldn't be able to play them again all season. 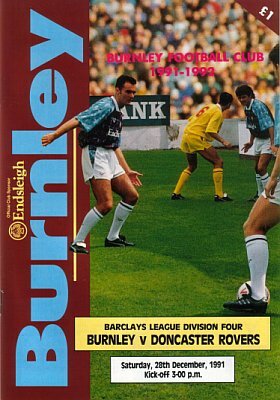 Burnley: Chris Pearce, Ian Measham, Joe Jakub, Steve Davis, John Pender, Andy Farrell, Adrian Randall (Mark Yates 69), John Deary, John Francis, Mike Conroy, Graham Lancashire (Roger Eli 69). Doncaster Rovers: Mark Samways, Paul Raven, Nick Limber, Jack Ashurst, Andy Crosby, Brian Rowe, Grant Morrow, Eddie Gormley (Roger McKenzie 64), Mark Rankine, John Muir, Kevin Noteman. Sub not used: Colin Douglas. Burnley didn't need the help of the teams below but got it anyway. Of the three within striking distance only Mansfield Town won. Barnet were held to a 2-2 draw at Hereford United and two Jason White goals gave Scunthorpe a 2-0 home win against Blackpool. 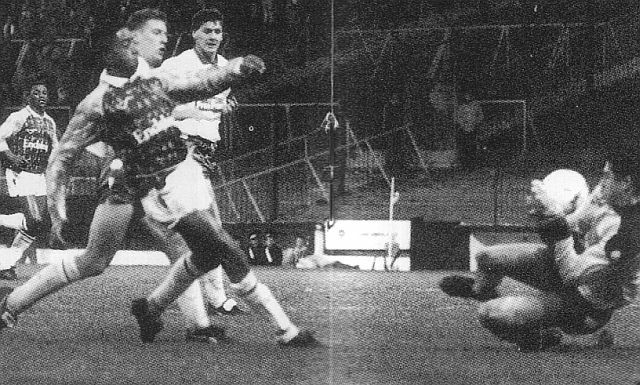 We were going into 1992 in a superb position but after seven years of Fourth Division football no one was getting over excited. It was hard not to though with 34 points from the last 13 games. The New Year would start at Chesterfield with a new goalkeeper, the one who Mullen said he had no intention of signing.